I just realised my past few posts were quite heavy, both conceptually and textually. So on a lighter note, along the lines of finding myself, I love a good flat lay and I love anything make up or beauty related. 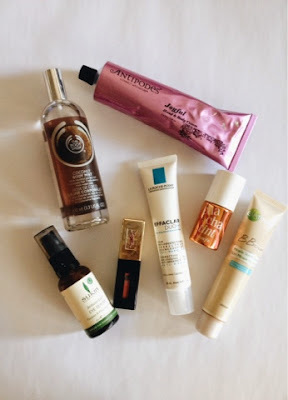 I thought I should share some of my summer beauty faves. Might help you (and me) to get to know the real me. My hands are dry year round and I love this hand and body cream by antipodes. Smells amazing and really moisturises. A bit of a splurge but I bought this when there was 40% off skincare at Priceline. Being a mum inevitably means a lack of sleep. This Sukin eye serum nourishes the dry patches under my eyes and makes me feel awake. I would definitely recommend Chemist Warehouse for cheap skincare. Adult acne. Did anyone else think spots would go away with your 21st birthday? Oh well, La Roche Posay Effeclar duo doesnt prevent spots, but my spots are less agressive and angry and make an elegant exit without leaving too much damage. Recommended by Ruth from A Model Recommends and Tanya Burr, how could I not get sucked in. Pricey, again but skin care is something I don't mind investing in. I'm on my second tube of this stuff. On days where I just want to look fresh and put together I employ Garniers BB cream for oily/combo skin. Evens out my skin tone and I find that I'm not as oily throughout the day. I'm all about tints and stains during summer. Colour that wont melt off my face as I walk out of my house. YSL's Rouge Pur Couture Vernis a Levres Glossy Stain in 7 along with Benefits Cha Cha tint are a great lip and cheek combo which sticks around all day. I know this was kinda random, kinda haphazard, kinda like me. What are some of your beauty favourites?